A partnership between the Virginia Commonwealth University School of Engineering and Midlothian-based AMC Technology has computer science students building user experience (better known as UX) enhancements — and their own creative problem-solving skills.AMC Technology, which provides customer relationship management and contact center integrations, and VCU Engineering have created a center near campus where computer science students receive training in an industry-standard software development process to meet customer-driven, real-world needs. The idea is a variation of AMC’s popular summer internship program with VCU. The AMC UX Design Center is located near VCU School of Engineering West Hall so students can intern with AMC without having to commute to the company’s Midlothian headquarters.“The summer internship program has been very successful — the students go through our boot camp and become productive quickly,” said Anthony Uliano, AMC founder and chief technology officer. “We wanted to make this concept more permanent and bring in more students. That was the idea behind leasing a space convenient to VCU.”Unlike many traditional internships, participation in the AMC UX Design Center takes place during the school year, carries no prerequisites and is open to computer science students in all years of study.But while the format may be flexible, the required commitment is not. Students in the design center undergo training based on AMC’s boot camp, which takes students through an intensive software development “sprint.” At the end of the sprint, students present their prototypes and receive feedback from AMC developers.“It’s not enough to code well. You have to be able to articulate your solution,” said Aimee Stinson, director of marketing for AMC. This agile software development methodology, used throughout the industry, generates prototypes in short increments of building and testing. “This means faster progress, and more visible progress,” said Uliano, adding that many students have studied agile development, but use it for the first time at AMC. Working in the agile development mode, students in the design center create product enhancements requested by AMC clients. These include improving UX features and integrating emerging technologies into AMC’s products. The partnership between AMC and VCU Engineering is longstanding and mutually beneficial. Designing real products for consumer use builds students’ problem-solving skills and helps them stand out in the industry. A product add-on that senior Benjamin Wunschel designed as an AMC intern last summer has attracted attention from Microsoft. Allen Calderwood, a 2015 graduate, met Google recruiters while attending the Dreamforce conference as an AMC intern. Today, he is a software developer at Google’s Silicon Valley headquarters. For AMC, one of the biggest benefits is the fresh perspective that students bring. Virginia Commonwealth University School of Engineering, located in Richmond, Virginia, opened in 1996 and houses three state-of-the-art engineering facilities, the School offers more than 300,000 square feet of the highest quality classrooms and laboratory space. Driven to be the national model for innovation in engineering and research, the School offers BS, MS, and PhD degrees in mechanical, nuclear, biomedical, electrical, computer and chemical and life science engineering, and computer science. 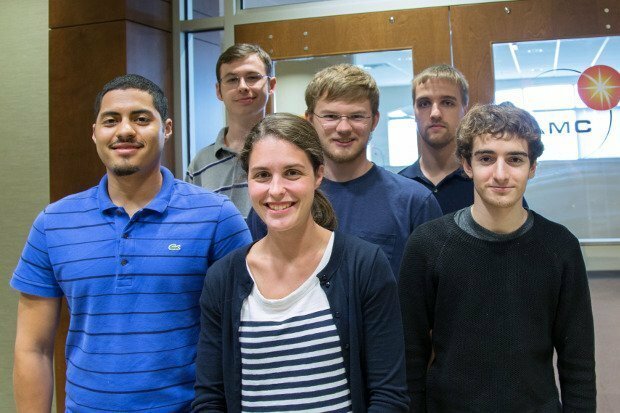 Interdisciplinary research opportunities are offered through the Center for Nanomaterials and Characterization, the Institute for Engineering and Medicine, the C. Kenneth and Dianne Harris Wright Virginia Microelectronics Center, and the da Vinci Center for Innovation. For more, see www.egr.vcu.edu.